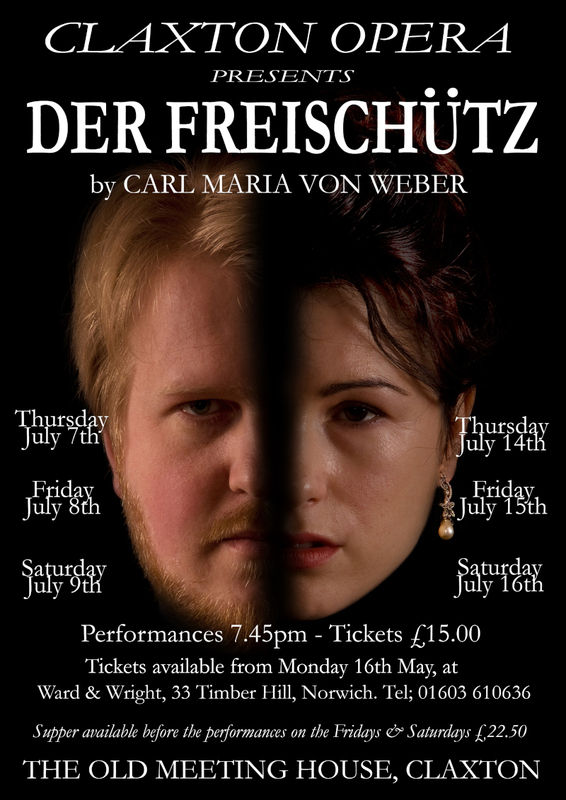 Der Freischütz is an opera in three acts by Carl Maria von Weber with a libretto by Friedrich Kind. It is considered the first important German Romantic opera, especially in its national identity and stark emotionality. Its plot is based on German folk legend, and many of its tunes were inspired by German folk music. Its unearthly portrayal of the supernatural is especially poignant in the famous Wolf's Glen scene. Despite its daring innovations (and some scathing attacks by critics), it quickly became an international success, with some 50 performances in the first 18 months after its premiere at the Konzerthaus Berlin on June 18, 1821. Among the many artists influenced by Der Freischütz was a young Richard Wagner. The title Der Freischütz comes from a German legend, and is difficult to render into English. It is usually translated as The Marksman or The Freeshooter. The young gamekeeper Max loves Agathe and is to become the successor to Kuno, the head ranger and Agathe's father but a test of skill in marksmanship is required, the trial to be held the following day. At a target shooting, Max loses to the young peasant Kilian, who is proclaimed "King of Marksmen". Because Max has had ill luck for several days he easily falls under the influence of Kaspar, who persuades Max to cast seven magic bullets to be used in the contest. Kaspar, whose soul on the morrow is to be forfeited to the devil, hopes to obtain three more years of grace by substituting Max in his place. Left alone, Max sinks into deep melancholy at the thought of losing Agathe through failure at the shooting contest. Kaspar with weird incantations tries to imbue him with courage. He hands Max his gun loaded with a magic bullet and to his own astonishment Max kills an eagle soaring at a great height. He resolves to go with Kaspar at midnight to the terrible Wolf’s Glen to cast the magic bullets, which will kill anything the shooter wants, in order to win the prize. Kaspar, left alone, triumphs. Agathe is filled with sad forebodings. She sings of her meeting with a hermit in the forest, who told her that in some danger which menaced her, she would be protected by her bridal wreath. At the moment when Max shoots the magic bullet, the picture of Agathe’s ancestor hanging against the wall falls to the floor, slightly wounding her. Agathe's cousin and companion Ännchen replaces it. Agathe is still more disturbed, but Ännchen endeavours to cheer her with jests. Agathe left alone awaits Max with the news of his success, which she decides to interpret as a favourable omen. Max arrives; he acknowledges that he has not been the victor, but explains that he has killed a deer, which he will bring this evening from the Wolf’s Glen. Notwithstanding the prayers of Agathe and Ännchen, Max departs. Kaspar calls upon Zamiel, the black ranger, for assistance, and prepares the casting of the magic bullets. Max arrives and is warned by the spirit of his mother to abandon the project. Zamiel conjures up the shape of Agathe, representing her as drowning herself in despair at Max’s ill success, whereupon he plunges into the glen and with demoniacal noise the casting of the bullets is begun. Agathe is praying. Her doubts have returned, owing to a dream of ill omen, but Ännchen again cheers her with laughter and song. The bridesmaids arrive with the bridal wreath. When Ännchen opens the box, however, she finds within a funeral wreath, which still further increases Agathe’s misgivings. She is somewhat comforted by the memory of the hermit’s promise that she shall be protected by her bridal wreath. Having split the seven bullets between them, Max has used four and Kaspar has used three. Max demands Kaspar give him his last bullet to use in the final shooting contest, but Kaspar refuses. As Max leaves, Kaspar shoots a fox, thus making Max's bullet the seventh and controlled by the Evil One. Duke Ottokar awaits Max at his tent. Max is now to shoot a dove. As he takes aim, Zamiel, the black huntsman, appears to guide the bullet, and causes Max to fire at Agathe, who is apparently wounded. Agathe falls, but her bridal wreath has deflected the bullet, which struck Kaspar. Agathe revives from her faint. Kaspar, seeing a holy hermit by her side, realizes that he has failed. Zamiel grasps him instead of Max, whereupon Kaspar expires with a curse upon his lips. Duke Ottokar orders the corpse to be thrown into the Wolf’s Glen, then demands and receives an explanation from Max. In spite of pleas from Kuno, Agathe, peasants, and huntsman, the infuriated Duke pronounces the sentence of banishment. Before this can be carried out, however, the hermit enters into their midst. The Duke acknowledges the holy man, and asks for his counsel. The hermit explains that the combined effects of love for Agathe, and fear of losing her should he fail the shooting trial are what caused Max to stray from a life that was formerly without fault. The hermit goes on to condemn the trial shot, suggests a probationary year as penalty, and asks who among the assembled has looked into their own heart and would be willing to cast the first stone. If Max lives a faultless life, he will gain forgiveness and be permitted to marry Agathe. The Duke commends the hermit for his wisdom saying a higher power speaks through him. The Duke ends his pronouncement by saying he, himself, will place the hand of Agathe in that of Max when the probation is over. The opera ends with the ensemble singing prayers of thanks. This is a dark story of love, hope and despair, set originally in a German village buried in the forest in the 17th century. The German forest is a place of mystery, the supernatural and lurking powers of evil. For us the forest is Merrie England, Robin Hood and Morris Men. This production is set in a late 19th century Prussian Officers Mess. Here we still have the strict hierachy, the honour codes, the essential conservatism, tradition and perhaps the darker bonds and secrets that such inward looking societies can engender.